Warm humid weather moved into the southern Ontario yesterday and sent demand upwards. The temperatures were very moderate in the earliest hours of the day, so demand was low - so low the pricing was negative for 4 hours and that meant nuclear units at Bruce reduced their output. It took a while after the IESO banned negatively priced exports but there now seems to be, effectively, a minimum price just below $0/MWh (thus each of the 4 hours was ~$-4.50/MWh). More unique than the pricing movement was the demand variance between the 12,458MW minimum in hour 3, and the 22,682 maximum in hour 20. The 10,224MW difference is the most severe in over 3 years and the 9th highest since the market opened (including 2 days for the blackout of 2003). I pulled some figures for the day as I was posting a report for the IESO week (Sept. 4-10). Readers of my blog will know peak summer demand as reported by the IESO has been both decreasing, and moving later in the day - and that's because of lousy (non-existent) reporting on the extremely expensive solar energy being generated by Ontario's wealthiest residents and sold to the rest of the province unnecessarily. There's a message going around the 'group think' circles that somehow intermittent variable power is more suited to demand profiles than nuclear (seen as steady baseload). Keeping in mind that for what the IESO is reporting as the minimum and maximum demand hours on the 10th, solar output was 0.... The last line of the embedded spreadsheets show the difference in production, by 'fuel', between the maximum and minimum demand hours. The greatest increase to match demand came from gas-fired generation, and then, in declining order, hydro, nuclear, reducing exports, increasing imports, coal, unknown (likely self-scheduling generators, which are likely small hydro), and the only source to offer less at peak, which is wind. I mentioned my weekly report earlier; one of the graphics I present there is built from my estimates of curtailed power. 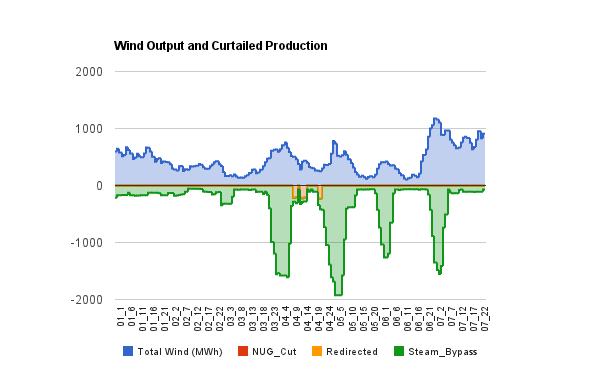 It shows the wee hours of the 10th were the 4th consecutive night where increased wind during low demand hours required steam bypass manoeuvres to reduce output from nuclear units. Aside from the positioning of gas and coal, this value order matches the averages in each of the 4 years in my data set. This indicates dispatchable generators are the best for matching demand, and wind the worst.